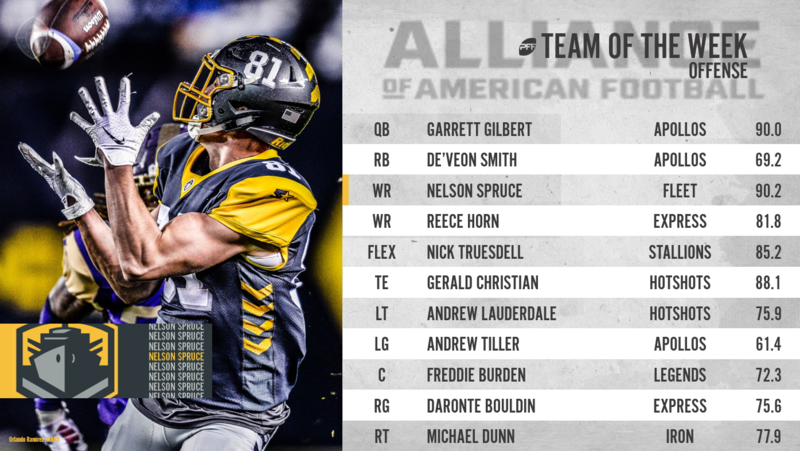 The seventh week of action in the Alliance of American Football’s first season is in the books, as are our grades for every player on every play of every game. Mirroring our Team of the Week from the NFL side of things, this season we’ll award players to our team of the week in an attempt to shed light on the top performances from the previous weekend’s slate of action. Gilbert was as sharp as ever, throwing just four incompletions in the big win over Atlanta. He rebounded nicely after the first loss of the season and of those incompletions, three of them weren’t his fault as two were throwaways and another was a drop. 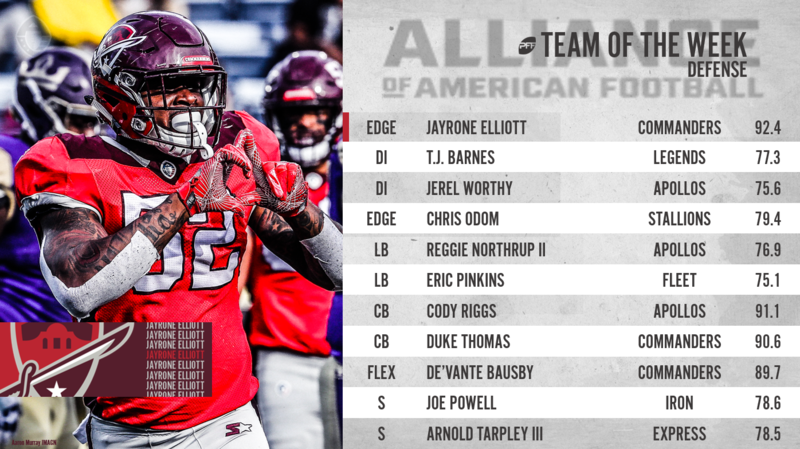 He remains the AAF’s highest-graded quarterback through seven weeks. Smith toted the rock 15 times for just 40 yards but it was his work in the trenches that got him here. He scored three touchdowns and broke a league-leading four tackles on his carries as he actually gained more yards after contact (45) than he had total rushing yards on Saturday. Spruce’s game grade would have been even higher had it not been for a fumble but he still performed at a high level despite the loss. On 14 targets, he hauled in 12 receptions for 146 yards and racked up 62 yards after the catch. His seven first-down receptions led the league this weekend. Johnny Manziel took the headlines but Horn’s performance in the Express’ come-from-behind win over Birmingham was terrific. He hauled in seven receptions for 113 yards and a score with an additional five first-down catches and a ridiculous 155.8 passer rating when targeted. While Christian hauled in only 22 yards on two receptions, his work in pass protection and in the run game give him a spot here. On 19 run-blocking snaps, he put forth the league’s third-highest run-blocking grade among qualifying tight ends and a top half pass-blocking grade. Lauderdale bounced around at left and right tackle, but it didn’t seem to matter as he did not allow a single pressure on 15 pass-blocking snaps and had the league’s highest run-blocking grade at tackle. Tiller finished with the league’s second-highest pass protection grade which more than made up for his lacking in run blocking. He didn’t allow a single pressure on 26 snaps in pass protection. Combining the highest pass-blocking grade and the second-highest run-blocking grade, Burden once again put forth an all-around game for the Legends despite some shaky blocking next to him. He’s been a bright spot on the Legends offensively this season. Bouldin allowed a single pressure on his 50 snaps in pass protection and put forth the league’s seventh-highest run-blocking grade among all linemen. Dunn allowed three pressures on his 53 pass-blocking snaps but was absolutely dominant on run blocks. His 85.2 run-blocking grade was by far the highest among any offensive lineman in Week 7. Elliott was a force against the pass for the Commanders. On just 22 pass-rushes, he recorded five pressures including a sack and a QB hit. His three defensive stops were the third-most among edge defenders this week and he forced a fumble to round out his day. Registering just a single tackle and a single pressure doesn’t seem like much but that’s how effective Barnes was despite the loss for the Legends. At times he seemed unblockable but was suspect to the Apollos quick passing game before a pressure could register. Worthy recorded two QB pressures on just 16 pass-rushes and made two defensive stops against the run. Not bad for a guy who played only 29 snaps in the decisive win for Orlando. Odom needed just 14 pass-rushes to record two pressures and just 25 total snaps to make his impact felt. His three defensive stops tied Elliott for third most this weekend. Flying to the ball like his days at Florida State, Northrup made a ridiculous five defensive stops while he limited receivers in his coverage to just 38 yards on 36 snaps against the pass. His eight total tackles help tell a part of the story as he was seemingly all over the field for Orlando. Pinkins put forth a strong outing, playing tight coverage for the Fleet as well as putting for strong grades across the field. On 13 snaps in coverage, he wasn’t even targeted while he made a defensive stop and five total tackles without a miss. The Apollos are once again represented on the CB of the week list after missing out for the first time all season a week ago. It shows how valuable coverage is in today’s football as Riggs allowed just three receptions on six targets and had an interception and a pass breakup to tally just a 22.2 passer rating when targeted. Thomas was also extremely impressive in coverage, allowing just 20.0% of the targets into his primary coverage to be caught. He saw five passes come his way, allowed just one reception, intercepted another and broke up two more. All told, he allowed a passer rating of 0.0 into his coverage. Bausby sealed the deal for the Commanders with his 2-point conversion ‘pick-6’ as he also had quite the day in coverage elsewhere. On five total targets, he allowed just 22 yards and limited receivers to no yards after the catch. Powell was kept relatively quiet for the Iron and may have missed out on the ‘flash plays’ that make safeties famous, but for those reasons, he earns his spot here. He was rarely out of position and on the lone target sent into his coverage, he broke up the pass. Tarpley broke up a pass in coverage but it was his effort across the field that sees him here. He made four total tackles and limited mistakes, including no missed tackles in both the passing game and in run defense.